Norfolk Yacht Agency have an excellent reputation for selling boats, thanks to our market knowledge and the effort that we put in to find a boat buyer and conclude a deal. At any time, we usually hold around 100 boats across our two sites. This variety of choice attracts serious buyers and as a result, we’re proud to sell over 300 boats a year. We work on a no sale, no fee basis and charge commission on the achieved sale price at 8% plus VAT, with a minimum commission of £1,500 including VAT. We offer free sales berths for six months on both of our dedicated sales sites in Horning and Brundall. We will advertise your boat on many boat sales platforms, including online and printed boating media. We also hold an extensive, well maintained database of potential buyers to whom we provide regular updates with our selection of boats for sale. All viewings are accompanied by a member of our sales team to ensure that your boat is treated respectfully and viewed at its best. You can rely on our hardworking team to make every effort to sell your boat. If you would like a market valuation contact us with details of your boat, we’d be delighted to help. Good quality internal and external images are useful, along with any specifications and history. Boats offered on a brokerage basis should be clean and in good working order and are sold as seen. If you would prefer your boat to be prepared to the same high standards as our stock boats, we can complete an inspection and provide a quote to carry out any necessary work. When you list your boat with us, we will keep your boat in top sale condition for a compulsory monthly exterior valeting fee of £1.30 per foot. We can arrange collection or transportation of your boat to our sales marinas, as required. 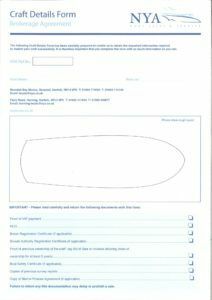 Please download and complete our craft detail form below in preperation for us marketing your boat.